These two dramatic additions to our New England's Hidden Histories program come from our project partners, the New England Historic Genealogical Society. The collections relate to judicial cases which were played out within the ecclesiastical framework of the Colonial era, before the separation of Church and State. The first collection dates to 1728 and consists of a Medford minister's overview of a 1720 witchcraft case in Littleton, Mass. The second dates to 1811-1814 and contains two large volumes of correspondence related to the disciplinary case of a female parishioner at Boylston, Mass. and heated arguments over church jurisdiction. Rev. 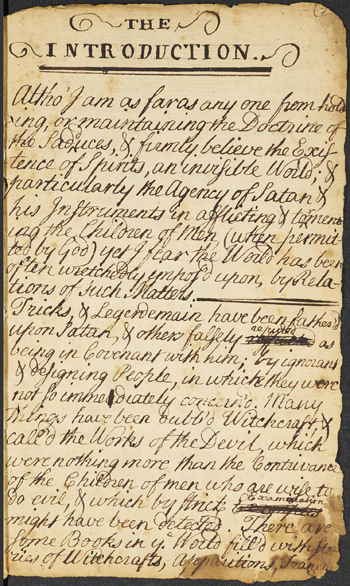 Ebenezer Turell, minister of the First Parish in Medford, Massachusetts, offers his opinion regarding a 1720 witchcraft case at Littleton, Mass. in this somewhat polemical essay. The handwritten volume contains a summary of alleged paranormal events besetting a Littleton family, local opinions and reactions, and an advisory section in which Rev. Turell warns against deceitful children and encourages watchfulness and the application of corporal punishment by adults. He advises against the conflation of "tricks and legerdemain" with genuine Satanic covenants. Rev. Turell's essay was written more than three decades after the infamous miscarriage of justice at Salem, Mass. during the 1692 witchcraft hysteria, in which the testimony of children was instrumental in the indictment and execution of innocent townspeople. This collection contains correspondence dating from 1811-1814, relating to a dispute between Congregational churches in Boylston and Worcester, Mass. Parishioner Betsy Flagg was a vocal opponent of the ministry of Rev. Ward Cotton and was consequently suspended from services until she recanted. Instead, Flagg began attending the nearby Congregational church of Worcester, Mass. under the auspices of Rev. Samuel Austin. Her lack of an official dismissal from Boylston created a disagreement between Revs. Cotton and Austin, escalating into mutual accusations and calls for arbitration by an ecclesiastical council. Ultimately the case was decided in favor of Rev. Cotton and against Miss Flagg, whose acceptance by the Worcester parish was deemed an overreach of the church's authority.